Sappho never fails to create the emotional incident around the passion of love from the symptoms which accompany it in real life. And wherein does she show her excellence? In the skill with which she selects and combines the most striking and intense of those symptoms. Is it not wonderful how she summones at the same time, soul, body, hearing, tongue, sight, colour, all as though they had wandered off apart from herself? She feels contradictory sensations, freezes, burns, raves, reasons — for one that is at the point of death is clearly beside herself. She wants to display not a single emotion but a whole congress of emotions. Lovers all show symptoms as these, but what gives supreme merit to her art, as I said the skill with which she chooses the most striking and combines them into a single whole. It is, I fancy, much in the same way that the poet in describing storms picks out the most alarming circumstances. It is the year of the Lord 1073. The two churches celebrate. Pope Gregory VII, the celibate campaigner, and his counterpart in Constantinople, the patriarch Constantine Psellus agree to end the schism. Needless to say, that it didn’t last; the Greek Orthodox Church would not stand for impositions from the Vatican. But for the time being it was honeymoon. In both Capitals the clergy immolated the “idolatrous and lewd” legacy of an ancient sorceress and what was believed to be of one of her numerous lovers. Pope Gregory VII in Rome and Michael Cerularius and Constantine Psellus in Constantinople destroyed simultaneously 11.000 verses of Sappho and Alceius, and thus obliterated, what had escaped till then the Norman raiders, Attila the Hun, the Byzantine iconoclasm, numerous fires and earthquakes and the neglect of the copyists. A continuous tradition of 1650 years had come to an end. May the names of the holy arsonists be remembered in infamy. Back in 580 BC we find ourselves in a provincial, deceptively idyllic situation. Across the Aegean and further south, towards the ports of Palestine, the Jewish state just breathed her last. Jeremiah ended his life as a refuge in Egypt and a young shaman who used to bake his bread over his own turds (Ezek. 4:12) took his first commissions from his Babylonian overlord. Babylon was the cosmopolitan hub of the world, the oyster in heaven, but the skies were high and Babylon far beyond the horizon. The Greek neighborhood was a loquacious lot, apparently forever divided in blood feuds between aristocratic clans and self-made tyrants who held a precarious mandate based on referenda and silent support by the commoners in tiny townships. Democracy had not been invented yet, continual vendettas and frequent banishments paused only briefly, when the Greek manhood assembled in Olympia. Being a Greek meant to be young and fit and in an unending competition for this one moment of fame. 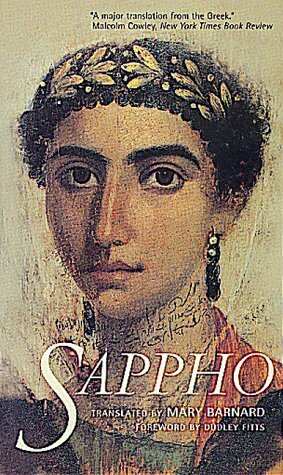 We know very little about Sappho’s life: she grew up and died on Lesbos, an island with steep slopes and sweltering olive groves and a ceaseless surf running flat at the fatigued beaches. There is an orthodox monastery high up in the hills, clusters of cats survey the blazing scene from the whitewashed garden walls and from the stepping stones of winding village lanes. The people are friendly, and tourists are invited to photograph a marble quarry which had been abandoned at Sappho’s time. I made friends among the locals, I learned to play backgammon, it was my first honeymoon, and a good time to get a seamless suntan. I watched with disapproval the brutal killing of the octopi but had no problem eating them. I began to see why Homer in his epics never uses the word ‘blue’: the sea there at dawn is black and mother of pearl pink. Sappho too refers to the ocean as “black.” The ancients in their esteem gave her the second place next to Homer. Sappho was a member of the local aristocracy and at some point of her life fell victim to the bitter feud between the rising powers of the commoners in the ports and towns and the landed gentry on the estates. After a bloody massacre she, and the surviving members of her clan were sent into exile. We know that she returned after ten years, a long time, when people still used to die rather young. That’s all the positive knowledge we have; the rest is legend. To my knowledge only Chapman, Herrick and Swinburne ever attempted something like this in English. Nothing of this format came through in Mary Barnard’s translation. In fact what Ms. Barnard did, was giving us a hybrid based on the principles laid out by William Carlos Williams. I am not saying that this was wrong. It is not how a translation should be, but apparently after so many failures of getting it right, this was the only option left, an option depending on the translator’s talents and instincts. Ms. Barnard has proven herself to be extremely talented.